For other uses, see Memento mori (disambiguation). Memento mori. Gravestone inscription (1746). Edinburgh. St. Cuthbert's Churchyard. Memento mori (Latin: "remember (that) you will die") is the medieval Latin Christian theory and practice of reflection on mortality, especially as a means of considering the vanity of earthly life and the transient nature of all earthly goods and pursuits. It is related to the ars moriendi ("The Art of Dying") and similar Western literature. Memento mori has been an important part of ascetic disciplines as a means of perfecting the character by cultivating detachment and other virtues, and by turning the attention towards the immortality of the soul and the afterlife. In art, memento mori are artistic or symbolic reminders of mortality. In the European Christian art context, "the expression [...] developed with the growth of Christianity, which emphasized Heaven, Hell, and salvation of the soul in the afterlife". In English, the phrase is pronounced /məˈmɛntoʊ ˈmɔːri/, mə-MEN-toh MOR-ee. Memento is the 2nd person singular future active imperative of meminī, "to remember, to bear in mind", usually serving as a warning: "remember!" Mori is the present active infinitive of the deponent verb morior, literally "to die". In other words, "remember death" or "remember that you will die". Plato's Phaedo, where the death of Socrates is recounted, introduces the idea that the proper practice of philosophy is "about nothing else but dying and being dead". The Stoics of classical antiquity were particularly prominent in their use of this discipline, and Seneca's letters are full of injunctions to meditate on death. The Stoic Epictetus told his students that when kissing their child, brother, or friend, they should remind themselves that they are mortal, curbing their pleasure, as do "those who stand behind men in their triumphs and remind them that they are mortal"
The 2nd-century A.D. Christian writer Tertullian claimed that during his triumphal procession, a victorious general would have someone (in later versions, a slave) standing behind him, holding a crown over his head and whispering "Respice post te. Hominem te memento" ("Look after you [to the time after your death] and remember you're [only] a man."). Though in modern times this has become a standard trope, in fact no ancient authors attest to this, and it may have been Christian moralizing rather than an accurate historical report. Dance of Death (15th-century fresco). No matter one's station in life, the Dance of Death unites all. The thought was then utilized in Christianity, whose strong emphasis on divine judgment, heaven, hell, and the salvation of the soul brought death to the forefront of consciousness. All memento mori works are products of Christian art. In the Christian context, the memento mori acquires a moralizing purpose quite opposed to the nunc est bibendum (now is the time to drink) theme of classical antiquity. To the Christian, the prospect of death serves to emphasize the emptiness and fleetingness of earthly pleasures, luxuries, and achievements, and thus also as an invitation to focus one's thoughts on the prospect of the afterlife. A Biblical injunction often associated with the memento mori in this context is In omnibus operibus tuis memorare novissima tua, et in aeternum non peccabis (the Vulgate's Latin rendering of Ecclesiasticus 7:40, "in all thy works be mindful of thy last end and thou wilt never sin.") This finds ritual expression in the rites of Ash Wednesday, when ashes are placed upon the worshipers' heads with the words, "Remember Man that you are dust and unto dust you shall return." Prince of Orange René of Châlon died in 1544 at age 25. His widow commissioned sculptor Ligier Richier to represent in the Cadaver Tomb of René of Chalon which shows him offering his heart to God, set against the painted splendour of his former worldly estate. Church of Saint-Étienne, Bar-le-Duc. The most obvious places to look for memento mori meditations are in funeral art and architecture. Perhaps the most striking to contemporary minds is the transi or cadaver tomb, a tomb that depicts the decayed corpse of the deceased. This became a fashion in the tombs of the wealthy in the fifteenth century, and surviving examples still create a stark reminder of the vanity of earthly riches. Later, Puritan tomb stones in the colonial United States frequently depicted winged skulls, skeletons, or angels snuffing out candles. These are among the numerous themes associated with skull imagery. Another example of memento mori is provided by the chapels of bones, such as the Capela dos Ossos in Évora or the Capuchin Crypt in Rome. These are chapels where the walls are totally or partially covered by human remains, mostly bones. The entrance to the Capela dos Ossos has the following sentence: "We bones, lying here bare, await yours." The danse macabre is another well-known example of the memento mori theme, with its dancing depiction of the Grim Reaper carrying off rich and poor alike. This and similar depictions of Death decorated many European churches. Danse Macabre, Op. 40, is a tone poem for orchestra written in 1874 by French composer Camille Saint-Saëns. Timepieces were formerly an apt reminder that your time on Earth grows shorter with each passing minute. Public clocks would be decorated with mottos such as ultima forsan ("perhaps the last" [hour]) or vulnerant omnes, ultima necat ("they all wound, and the last kills"). Even today, clocks often carry the motto tempus fugit, "time flees". Old striking clocks often sported automata who would appear and strike the hour; some of the celebrated automaton clocks from Augsburg, Germany had Death striking the hour. The several computerized "death clocks" revive this old idea. Private people carried smaller reminders of their own mortality. Mary, Queen of Scots owned a large watch carved in the form of a silver skull, embellished with the lines of Horace, "Pale death knocks with the same tempo upon the huts of the poor and the towers of Kings." In the late 16th and through the 17th century, memento mori rings were made. 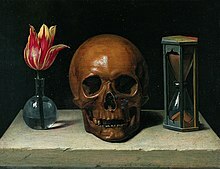 A version of the theme in the artistic genre of still life is more often referred to as a vanitas, Latin for "vanity". These include symbols of mortality, whether obvious ones such as skulls or more subtle ones such as a flower losing its petals. See the themes associated with the image of the skull. Memento mori is also an important literary theme. Well-known literary meditations on death in English prose include Sir Thomas Browne's Hydriotaphia, Urn Burial and Jeremy Taylor's Holy Living and Holy Dying. These works were part of a Jacobean cult of melancholia that marked the end of the Elizabethan era. In the late eighteenth century, literary elegies were a common genre; Thomas Gray's Elegy Written in a Country Churchyard and Edward Young's Night Thoughts are typical members of the genre. Omnia mors perimit et nulli miseretur. Ad mortem festinamus peccare desistamus. Death destroys everything and takes pity on no one. To death we are hastening, let us refrain from sinning. Intrare non poteris regnum Dei beatus. You will not be able to enter, blessed, the Kingdom of God. 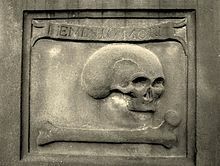 Memento mori was the salutation used by the Hermits of St. Paul of France (1620-1633), also known as the Brothers of Death. It is sometimes claimed that the Trappists use this salutation, but this is not true. Colonial American art saw a large number of memento mori images due to Puritan influence. The Puritan community in 17th-century North America looked down upon art because they believed that it drew the faithful away from God and, if away from God, then it could only lead to the devil. However, portraits were considered historical records and, as such, they were allowed. Thomas Smith, a 17th-century Puritan, fought in many naval battles and also painted. In his self-portrait, we see these pursuits represented alongside a typical Puritan memento mori with a skull, suggesting his awareness of imminent death. Why why should I the World be minding, Therein a World of Evils Finding. Then Farwell World: Farwell thy jarres, thy Joies thy Toies thy Wiles thy Warrs. Truth Sounds Retreat: I am not sorye. The Eternall Drawes to him my heart, By Faith (which can thy Force Subvert) To Crowne me (after Grace) with Glory. Much memento mori art is associated with the Mexican festival Day of the Dead, including skull-shaped candies and bread loaves adorned with bread "bones." This theme was also famously expressed in the works of the Mexican engraver José Guadalupe Posada, in which people from various walks of life are depicted as skeletons. Another manifestation of memento mori is found in the Mexican "Calavera", a literary composition in verse form normally written in honour of a person who is still alive, but written as if that person were dead. These compositions have a comedic tone and are often offered from one friend to another during Day of the Dead. The Buddhist practice maraṇasati meditates on death. The word is a Pāli compound of maraṇa 'death' (an Indo-European cognate of Latin mori) and sati 'awareness', so very close to memento mori. It is first used in early Buddhist texts, the suttapiṭaka of the Pāli Canon, with parallels in the āgamas of the "Northern" Schools. The Way of the Samurai is, morning after morning, the practice of death, considering whether it will be here or be there, imagining the most sightly way of dying, and putting one's mind firmly in death. Although this may be a most difficult thing, if one will do it, it can be done. There is nothing that one should suppose cannot be done. In the annual appreciation of cherry blossom and fall colors, hanami and momijigari, the samurai philosophized that things are most splendid at the moment before their fall, and to aim to live and die in a similar fashion. 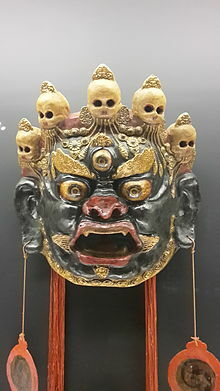 Tibetan Citipati mask depicting Mahākāla. The skull mask of Citipati is a reminder of the impermanence of life and the eternal cycle of life and death. The human body is a compounded thing. Therefore, death of the body is certain. The time of death is uncertain and beyond our control. There are a number of classic verse formulations of these contemplations meant for daily reflection to overcome our strong habitual tendency to live as though we will certainly not die today. अध्रुवं त्रिभवं शरदभ्रनिभं नटरङ्गसमा जगिर् ऊर्मिच्युती। गिरिनद्यसमं लघुशीघ्रजवं व्रजतायु जगे यथ विद्यु नभे॥ The three worlds are fleeting like autumn clouds. Like a staged performance, beings come and go. In tumultuous waves, rushing by, like rapids over a cliff. Like lightning, wanderers in samsara burst into existence, and are gone in a flash. ज्वलितं त्रिभवं जरव्याधिदुखैः मरणाग्निप्रदीप्तमनाथमिदम्। भवनि शरणे सद मूढ जगत् भ्रमती भ्रमरो यथ कुम्भगतो॥ Beings are ablaze with the sufferings of sickness and old age, And with no defence against the conflagration of Death The bewildered, seeking refuge in worldly existence Spin round and round, like bees trapped in a jar. सर्वे क्षयान्ता निचयाः पतनान्ताः समुच्छ्रयाः | सम्योगा विप्रयोगान्ता मरणान्तं हि जीवितम् |1,22| All that is acquired will be lost What rises will fall Where there is meeting there will be separation What is born will surely die. In a practice text written by the 19th century Tibetan master Dudjom Lingpa for serious meditators, he formulates the second contemplation in this way. An oral commentary by the translator is available on YouTube here. "On this occasion when you have such a bounty of opportunities in terms of your body, environment, friends, spiritual mentors, time, and practical instructions, without procrastinating until tomorrow and the next day, arouse a sense of urgency, as if a spark landed on your body or a grain of sand fell in your eye. If you have not swiftly applied yourself to practice, examine the births and deaths of other beings and reflect again and again on the unpredictability of your lifespan and the time of your death, and on the uncertainty of your own situation. Meditate on this until you have definitively integrated it with your mind... The appearances of this life, including your surroundings and friends, are like last night’s dream, and this life passes more swiftly than a flash of lightning in the sky. There is no end to this meaningless work. What a joke to prepare to live forever! Wherever you are born in the heights or depths of saṃsāra, the great noose of suffering will hold you tight. Acquiring freedom for yourself is as rare as a star in the daytime, so how is it possible to practice and achieve liberation? The root of all mind training and practical instructions is planted by knowing the nature of existence. There is no other way. I, an old vagabond, have shaken my beggar’s satchel, and this is what came out." You have obtained a human life, which is difficult to find, Have aroused an intention of a spirit of emergence, which is difficult to arouse, Have met a qualified guru, who is difficult to meet, And you have encountered the sublime Dharma, which is difficult to encounter. Reflect again and again on the difficulty Of obtaining such a fine human life. If you do not make this meaningful, It will be like a butter lamp in the wind of impermanence. Do not count on this lasting a long time. The Tibetan Canon also includes copious materials on the meditative preparation for the death process and intermediate period [bardo] between death and rebirth. Amongst them are the famous "Tibetan Book of the Dead", in Tibetan Bardo Thodol, the "Natural Liberation through Hearing in the Bardo". The "remembrance of death" (Arabic: تذكرة الموت‎, Tadhkirat al-Mawt) has been a major topic of Islamic spirituality (i.e. "tazkiya" meaning self-purification, or purification of the heart) since the time of the Prophet Muhammad in Medina. It is grounded in the Qur'an, where there are recurring injunctions to pay heed to the fate of previous generations. The hadith literature, which preserves the teachings of Prophet Muhammad (صلى الله عليه و سلم) , records advice for believers to "remember often death, the destroyer of pleasures." Some Sufis have been called "ahl al-qubur," the "people of the graves," because of their practice of frequenting graveyards to ponder on mortality and the vanity of life, based on the teaching of the Prophet Muhammad to visit graves. Al-Ghazali devotes to this topic the last book of his "Revival of the Religious Sciences". ^ a b Literally 'remember (that you have) to die', Oxford English Dictionary, Third Edition, June 2001. ^ See Jeremy Taylor, Holy Living and Holy Dying. ^ "Final Farewell: The Culture of Death and the Afterlife". Museum of Art and Archaeology, University of Missouri. Archived from the original on 2010-06-06. Retrieved 13 January 2015. ^ Charlton T. Lewis, Charles Short, A Latin Dictionary, ss.vv. ^ Oxford English Dictionary, Third Edition, s.v. ^ See his Moral Letters to Lucilius. ^ Taylor, Gerald; Scarisbrick, Diana (1978). Finger Rings From Ancient Egypt to the Present Day. Ashmolean Museum. p. 76. ISBN 0-900090-54-5. ^ See a revised selection here. ^ See "A Buddhist Guide to Death, Dying and Suffering". ^ "Foolish Dharma of an Idiot Clothed in Mud and Feathers, in 'Dujdom Lingpa's Visions of the Great Perfection, Volume 1', B. Alan Wallace (translator), Wisdom Publications"
^ The English text is available here. The Tibetan text is available here. Oral Commentary by a student of Rinpoche, B. Alan Wallace, is available here. ^ For instance, sura "Yasin", 36:31, "Have they not seen how many generations We destroyed before them, which indeed returned not unto them?". ^ "Hadith - The Book of Miscellany - Riyad as-Salihin - Sunnah.com - Sayings and Teachings of Prophet Muhammad (صلى الله عليه و سلم)". ^ "Hadith - Book of Funerals (Kitab Al-Jana'iz) - Sunan Abi Dawud - Sunnah.com - Sayings and Teachings of Prophet Muhammad (صلى الله عليه و سلم)". ^ Al-Ghazali on Death and the Afterlife, tr. by T.J. Winter. Cambridge, Islamic Texts Society, 1989. Several articles on this topic at the Matheson Trust Library. A modern example of a memento mori and the power of symbolism. This page is based on the Wikipedia article Memento mori; it is used under the Creative Commons Attribution-ShareAlike 3.0 Unported License (CC-BY-SA). You may redistribute it, verbatim or modified, providing that you comply with the terms of the CC-BY-SA.